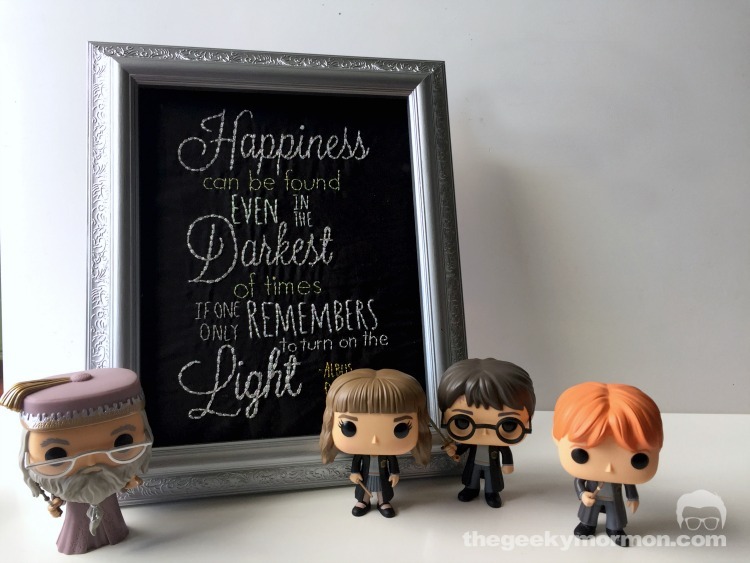 Last year I participated in the Happy Harry Potter Series that Marissa from Rae Gun Ramblings puts on each July and this year I joined in again but instead of doing one Harry Potter project here on my blog I decided to do two, one here and one over on my husband's blog The Geeky Mormon. 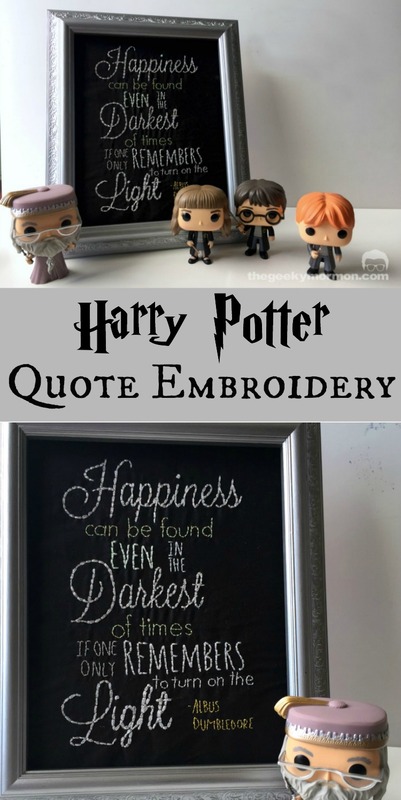 Today I am sharing this Harry Potter themed embroidery over there, next week I have another project that I will be sharing here. 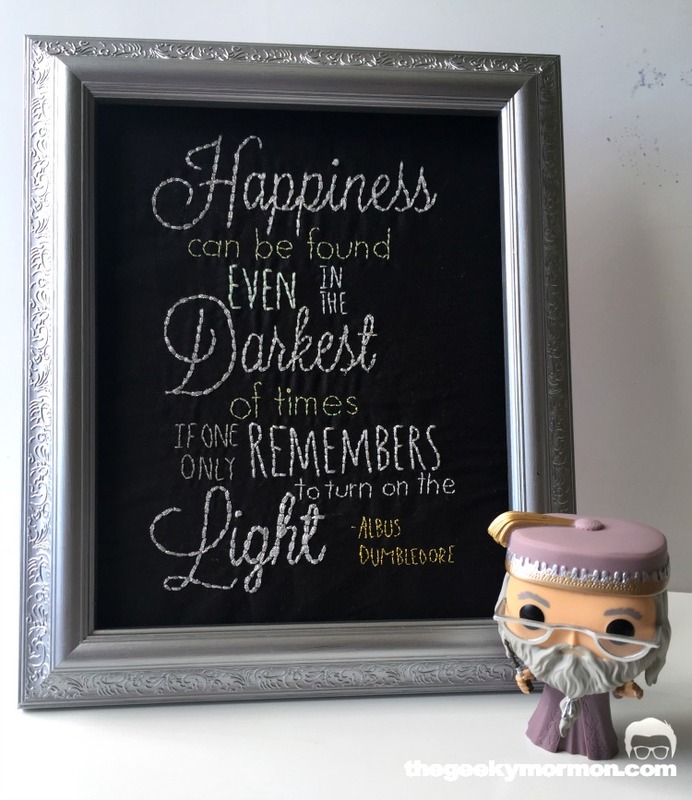 For this project I decided to embroider a quote from Dumbledore that he says in one of the movies. It is a pretty popular quote so I'm sure you've heard it before and seen different versions of it but I like it so this is my version. Since the quote talks about darkness and light I thought it would be fun to show that contrast by using black fabric and shiny metallic threads. The thread that I used was from a Bag O' Bits from Kreinik Threads and it came with an assortment of different sizes and colors of metallic threads so I picked out some different weights and colors, I stuck with whites, silvers, yellows, and a little gold, and used them to embroider the words on the black fabric. I stuck it in a cheap Walmart frame that I painted silver to finish it. I was pretty happy with the way it turned out. 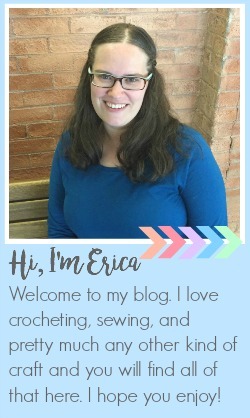 You can find the free pattern and instructions over on The Geeky Mormon. I love this! Thank you for sharing the pattern!